Sunday morning we got up early and planned to head around to the North of Antigua. We upped anchor and Andrew carefully navigated out of the very narrow and poorly charted ‘Spithead Channel’ – we had great light for identifying the reef on either side but it was still pretty scary. Safely through and we set the sails for our waypoint on the north east coast, the sea was not as big as we had expected and the 20 knots at 120 degrees was just perfect sailing for Askari. 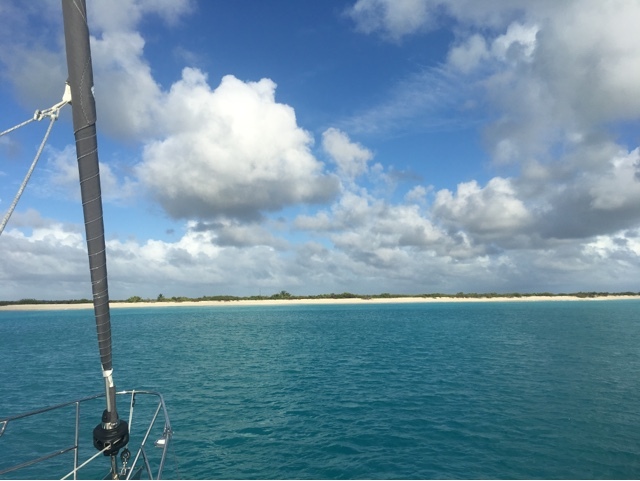 So we changed our minds and kept sailing directly to Barbuda 30 miles north of us. 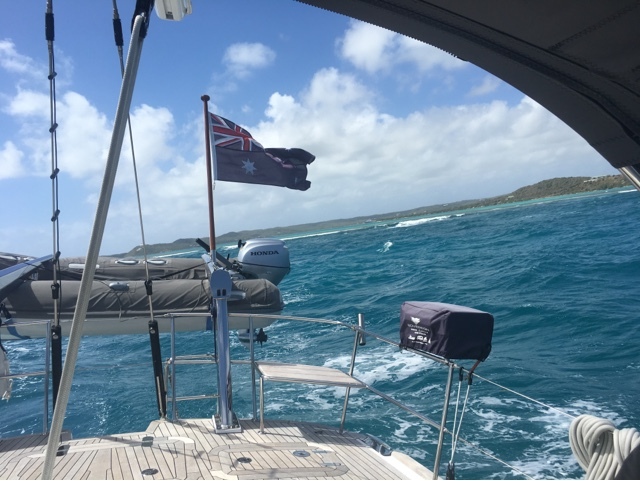 We had such a great sail and by 3pm we were off the south west point of Barbuda. It was amazing; the island is so low you can only see it at about 5 miles off; we spent most of the way there reading up on the anchorages and consulting a document of anchorage changes as a result of new rules and regs that was soooo confusing. We settled on the anchorage on the west coast, even though this was most exposed to swell but was closest to the point you can get a water taxi across the lagoon, to the one town and the frigate bird sanctuary. The bay was stunning, an eleven mile long beach with just one small hotel building and one shack, the water was crystal clear and there was only 4 other boats at anchor. We have long wanted to visit Barbuda so we were super excited and straight away called on the radio to Garden of Eden – George Jeffery to book a tour of the frigate bird sanctuary for the next morning. Barbuda is part of Antigua & Barbuda but the Barbudans are hugely independent and very different to Antiguans; they oppose outside influence and are very proud of the natural state of their island and their heritage. There is only about 2,000 people living on the island which is about half the size of Antigua, donkey’s and horses roam free and land on the island is jointly owned communally (so land cannot be sold to outsiders for development). The frigate bird colony is bigger than anything in the Galapagos and the tour allows you to get right up close to the birds. We went on the tour with other yachties Ute, Lionel and Elsie and had the chance to spend some time in Codrington afterwards, where Andrew ended up in a huge cricket debate with a bunch of locals guys. George our guide was just brilliant – what a great day. On the way back we were joined by Dan and Lori from BeBe, who invited everyone to their boat for sundowners that night. We got back to Askari and went off for a fabulous snorkel on West Tucson Rock – way out of the bay but the fish life was great and we got to see another Spotted Eagle Ray. As we headed back to Askari both Supertramp and Aqualuna arrived too – a quick drink before sundowners and more business for George next day! Tuesday was a lovely calm day – perfect for a big paddle board along the stunning beach; that was until a swell caught me and dumped me in complete with my Dior sunglasses. I spent ages trying to find them before getting Andrew to help, we spent about an hour diving along the area of the beach until success he found them! Hurrah – no sunnies for paddlin anymore!! 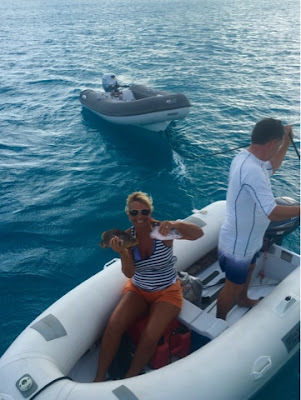 On the way back from the Frigate tour Fi had bought some fish on the dock, so a fish dinner was planned on Supertramp after sundowners with Aqualuna too who had managed to secure a huge lobster – oh so much fun! Next morning the Lunatics and the Tramps left for St Bart’s and we decided we had unfinished business in Antigua so sailed south.